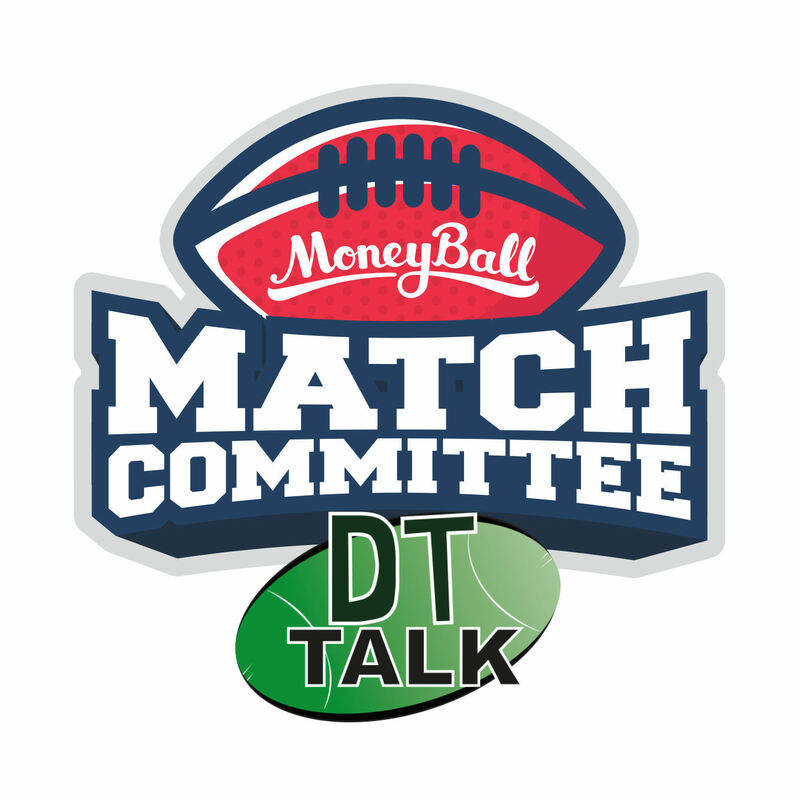 Get your Match Committee fix here folks, and make sure you’re squared away for another Partial Lockout week! While you’re there, it’d be rude not to slip in a cheeky Moneyball squad, wouldn’t it? With mouth-watering offerings of 135 and 113 in his last two, Nic Newman ($6,100 DEF) is criminally underpriced, and might just be the most selected player in the Friday contest. Dane Rampe’s return to the side will only benefit him, as the All-Australian defenders filled a key position post last week while Newman floated out a back flank. Hawthorn have been giving up 2.7 scores of 120+ per game over last three weeks, which is easily the most in the league and comes despite an uptick in form. Meanwhile, Dan Hannebery ($10,000 MID) has heated up, scoring 115, 117 and 159 in his last three attempts. This could be a case of two trends colliding, and the upside is tantalising. A big reason for Hanners’ resurgence is that he’s getting his points cheaper; he averaged just 2 in the first five rounds of the season, but that’s skyrocketed to 6.75 in the four games since. Taylor Duryea ($6,100 DEF): Managed to squeeze out 70 in a return to the senior side last week. Do we think he can get back to his 2015 best, where he averaged 100 over the Finals series? I’m hesitant based on more recent form, so maybe keep him on the watchlist for now. Callum Mills ($6,600 DEF): The Rising Star has been horrible most of the year, but that’s largely because he was filling the void left by Rampe’s injury. He’s rebounded with 86 and 91 in his last two and was playing pure midfield last weekend. Liam Shiels ($7,800 MID): 120 and 103 in the last two and his form often lines up with Hawthorns. Put him in all your Hawk stacks at that price. Did you know that Seb Ross ($9,600 MID) is very, very good at fantasy footy? 5 of his last 6 scores have been above 110, which only a very elite handful of players can claim at this point in the season. He’s a quiet achiever, ranked 8th for fantasy points scored since Round 3. So the question is, why aren’t more people talking about Seb Ross? Mitch Wallis ($7,300 MID): 97 in first game back from a broken leg, and was very close to BOG. There’s no reason why he can’t back it up, especially when you take into account his VFL form. Caleb Daniel ($7,600 FWD): FWD status is handy and is the proud manufacturer of 3 scores of 98 or more in the last four. Pure midfield now and scoring accordingly. Jack Steele ($8,200 MID): Steele’s 4 highest scores in his career have all been within the last 5 weeks. R5: Nankervis (131) from 56 hitouts. R6: Bellchambers (91) from 33 hitouts. R7: McEvoy (124) from 53 hitouts. R8: Jacobs (132) from 74 hitouts. R9: Goldstein (148) from 61 hitouts. Could Jarrod Witts ($7,100 RU) be the biggest Moneyball lock in history this week? He’s pumped out 121 and 96 in his last two and those were against actual ruckmen. Bernie Vince has held his victims in Sloane to 63 and Higgins to 83 in the past fortnight and after that success, it’s hard to see Goodwin changing a winning formula. With that in mind, do you perhaps fade Hall this week, as tempting as his recent scores of 156 and 134 make him? Looking back through the games this year, the only time a Sun was tagged this year was actually Hall in Round 4, where he failed to reach the ton. I’d be worried. Cam Pedersen ($6,800 FWD): Getting destroyed in the hitouts, yet has still scored 98, 97, 94 and 120 this season. He’s the exception to the rule, unless your rule is to always pick Cam Pedersen. Will Brodie ($4,500 MID): Was impressive with 77 points from 79 minutes in one of the JLT games. Risky and a shame he’s not at basement price, but the potential is there. Michael Hibberd ($7,100 DEF): Finally broke the magical century barrier, 106 and 107 in last two. Designated distributors are always fun to own in Moneyball. We thought Soldo might have been a handbrake for old Toby Nankervis ($7,600 RU), but that wasn’t the case – although that’s almost not worth mentioning, as Soldo has been given the arse this week. After a brief dip earlier in the season, Nank The Tank has produced 131, 94, 92 and 98 in his past four matches! He’s done this despite winning just 20 and 19 hitouts for the past two weeks, mind you. Imagine if he starts winning a few taps? Public service announcement: Dyson Heppell ($9,000 MID) isn’t the fantasy guy we thought he was. He was red hot to start the year with 156, 96 and 115 and everyone jumped aboard. However, he’s produced a top score of 100 in the six games since. Add in the fact that he’s only managed a single century in his last 7 Richmond clashes, and he’s a solid fade candidate this week. Dustin Martin ($10,000 MID): 123 and 161 against the Bombers last year, albeit without the banned blokes. Has a lowest score of 90 in his past five, so he’s a safe pick with monster upside. David Myers ($4,900 MID): Showed signs of life with 20 disposals, 8 marks and 83 points. Outside role last week and hopefully that continues, with marks being the key stat for Myers. Tom Bellchambers ($5,500 RU): 91 in his only other game this year, and worth a crack against a weak tap ruckman. In the 36 games Jon Griffin’s ($5,900 RU) played without Sandi as a Docker, he’s averaged a healthy 78 points. Despite Jacobs’ excellent recent scoring, Adelaide actually rank 5th easiest for rucks to score against in the past five weeks, which gives me a boost of confidence for Griffin against his old team. He’s scored 118 and 119 in his last two WAFL performances, so he’s in form and ready to go. Michael Walters ($7,200 FWD): Why wouldn’t you pick him? Sonny’s shiny new midfield role has equated to scores of 137 & 118 and you don’t mess with his role when he’s winning you games and racking up Brownlow votes. Hugh Greenwood ($3,800 MID): 93 on debut! Playing forward, so will need goals to bust out another big total, but I have more faith in Greenwood than most in the under $6k bracket. Brad Crouch ($7,800 MID): 102 last week and Hampton’s midfield time is up for grabs. Still cheap and ultimately, his surname is Crouch after all. It’s time for our weekly look at the Brisbane Backline Rule! Adding to those numbers is that last year against the Lions, Mason Cox kicked 4.2 and Jesse White booted 3.2, although neither are likely to play this week so we’re left with Moore as our fallback option. In a vacuum, Moore has been poor this year, failing to kick more than 2 goals in a game all year. Luckily, playing Brisbane is the perfect way to bounce back into form! In Dayne Beams’ ($9,500 MID) last 7 games without Rocky, he’s averaged a monster 114 and 4 of those games were over 120! Beamer showed no signs of injury last week, casually racking up 40 touches for 144. This is the easiest pick you’ll have all weekend, jump on. Ryan Lester ($6,700 MID): Just casually producing scores of 94, 106 and 87 in last three. Midfield time is through the roof with regulars out, and with Rocky and Robertson still missing, he’s great value. Jamie Elliott ($6,100 FWD): Another guy who could easily cash in on the Lion backline. Scores of 91, 88 and 80 in last three and looking like he’s back to his classy self. Adam Treloar ($10,300 MID): Loves playing Lions, with last three scores of 115, 120, 131 against them. 113: Stefan Martin. Averaging 42 hitouts. 107: Brodie Grundy. Averaging 37 hitouts. 103: Sam Jacobs. Averaging 43 hitouts. 100: Matthew Kreuzer. Averaging 27 hitouts. Amazing numbers. Kreuz is getting it done around the ground, and like Nank, we can almost disregard his rucking opponent because he doesn’t need hitouts to hit big scores. I’m a big Sam Docherty ($10,700 DEF) fan, and he almost has to sit in your side every time Carlton play. He’s offered up a lowest score of 90 all year, averages 127 in the last month of action and scores well even when Carlton do Carlton things. Beast in all forms of the game. Kayne Turner ($5,900 FWD): Surprising form, averaging 86 in his last four as a huge benefiacry of North’s rebuilding midfield. Ben Cunnington ($7,600 MID): I mention him every week. The workhorse has 89 or better in 5 of last 6. He’s currently the Roos best midfielder alongside Higgins. The Eagles are ranked 2nd easiest for giving points to rucks in their last five this year, which has to be expected when you’re rolling out combinations of Vardy/Giles/McInnes/Petrie on any given week. Fortunately for us in DFS land, Shane Mumford ($8,000 RU) is a hungry hungry man. Mummy had 99 points the last time he faced the Eagles and that was against NicNat. Stretching back to last year, Lachie Whitfield ($7,500 MID) has now averaged 99.4 in his past five games. A big reason for this is his awesome outside game, and his average of 20.5 uncontested possessions is ranked 9th in the league. Why wouldn’t you want to pick Whitfield when even his own teammates make it a priority to get the footy into his hands? Elliot Yeo ($9.500 MID): We’ll keep coming back to Yeo and his inconsistency – or is it consistent when the trend is blindingly clear? He averages a monster 121 in wins this year, but that drops to a worrying 78 in losses, and that’s with a decent sample size now. The big question is, do the Eagles beat the Giants this week? Tim Taranto ($5,800 MID): Eagles midfield is hurting right now, bleeding points all through the guts. Taranto had a career-best 84 last week and is too cheap to ignore based on the trends. Luke Shuey ($10,300 MID): Loves playing GWS. Averages 110 against them in career (wow) and busted out a 142 on them last year. Do I play Grundy or Witts? !